CheckMate Pro v2, the new highest standard of quality for 3D models, went into effect on June 15, 2013. Assets approved using the Checkmate Pro v2 specification will continue to don the same badge as the original CheckMate Pro, however they will be required to pass added steps within the certification process, including stricter topology requirements, to meet the demands of modern pipelines. A series of training videos are currently in production, geared toward assisting artists pass the new certification process with ease as well as tips on topics such as achieving flawless edge flow. Click here for specifics on the new requirements as explained by our very own CheckMate Ambassador. We’ve updated our list of suggested Checkmate Pro Models to Make. While you’re counting down the days til the summer heat is gone, stay in the cool indoors while our list of models keeps you busy. We are always looking for ways to better TurboSquid.com. The latest initiative, which we have provided you with access to, is one that we anticipate will result in a number of improvements impacting both artists and customers, including more relevant search results, better pricing and sales data, to name a few. Just over a year ago, we came to the realization that in order to improve how users search and purchase, it was necessary for us to gain a deeper understanding of the products available on TurboSquid.com. Since then a dedicated in-house team has been busy defining and developing a system that will allow us to categorize every asset available on the site. The result of their efforts is a product that we are calling Feature Graph. Prior to the development of Feature Graph, there were only 300 categories available to which an asset could be assigned. This new, more powerful category system contains 13,000 active categories, with a growing list of over 26,000 keywords that have been mapped or assigned to the categories. Log into your TurboSquid account. Perform a keyword search allowing time for the dropdown menu of suggested categories to appear. Use your mouse to select and click on any one of the 10 categories provided as they relate to the term you have entered. Do not press “enter” to execute your search; this will not provide results driven by Feature Graph rather it will show the current live result set. 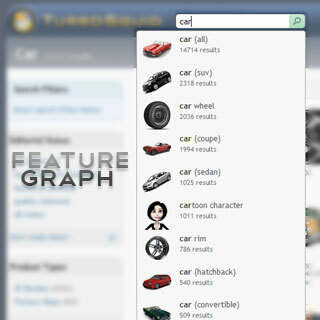 Compare Feature Graph category search results to live search results. Your experience and feedback regarding this new development is very valuable as we look for ways to better prepare this product for launch on TurboSquid.com. Please submit your issues, findings and suggestions to breadcrumbs@turbosquid.com. Read more about how to use Feature Graph and what it means for you. This month in Inspector Picks, we managed to highlight a few models that were gorgeous and extremely well done, but none captured our fans’ attention like this 2014 Corvette Stingray by Arte 3D. Read on to find out why Inspector Mark chose this as his Inspector Pick of the Week, and keep an eye out for all of our Inspector Picks. This month’s featured model was created by talented TS artist, Milos Jakubec. Find out what makes Milos tick, why watches are his favorite items to model, and what being a TurboSquid artist means for him in this month’s featured artist interview. We’re looking for the next CheckMate Pro model worthy of home page placement. Think one of your creations has what it takes to be the next Featured Model? Click here for details.